Do you have a bathroom all to yourself, or like most busy households do you share your bathroom with other family members? For many of us, the master, family, and hall bath are places where we must co-exist with other family members or visiting guests. Why not make this a peaceful partnership by creating a bathroom design that eases the flow of traffic through the bathroom and gives everyone the space they need to face the morning. Your bathroom is the place where you start and end your day, and a carefully planned layout will help make it easier for multiple people to get ready simultaneously. Just like your kitchen layout has work zones, the bathroom layout consists of a toilet area, bathing area, and sink area. Design these areas to ensure they are clearly laid out with an easy flow between them, and you will create an efficient, peaceful environment for your morning and evening routine. Add greater privacy by separating the shower or toilet area to make it easier for multiple people to use the bathroom at the same time. 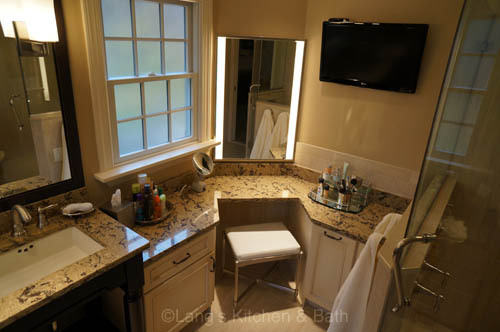 The sink and vanity are a focal point for many activities in the bathroom, like shaving, brushing teeth, and applying make-up. You can avoid bumping into each other while getting ready by creating a dedicated space for each person. 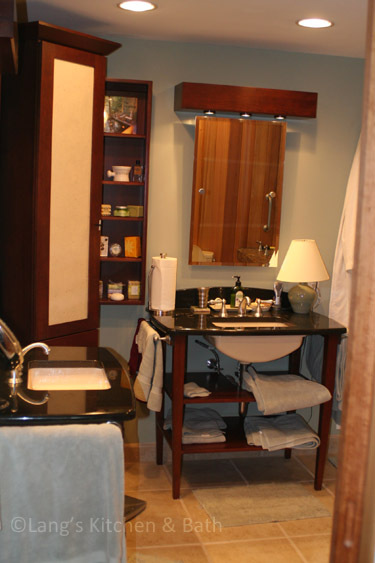 One way to achieve this is by installing two sinks in a larger vanity, like the one pictured here, which allows individual space to organize toiletries and get ready. The downside of two sinks is that you must have a bathroom footprint big enough to accommodate the approximately 6-foot long countertop required. Two sinks also take up more space both above and below the countertop, and they cost more for plumbing. An alternative option is to install one longer sink with two faucets, which still provides sufficient space for two people but is less intrusive and requires only one set of plumbing under the counter. Two separate sinks with individual storage like the one shown here is another way to add personal space to a shared bathroom design. The bathroom should be an oasis of calm to help you get the best start to your day, and it is difficult to do this if you are tripping over dirty towels and hairdryers. The best way to coexist in a shared bathroom is to reduce the clutter and utilize dedicated storage space to get organized. 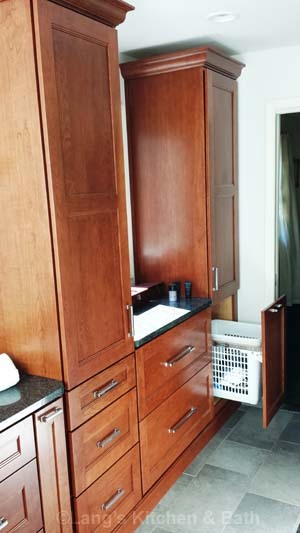 Include personalized storage solutions in your bathroom design for the individuals using the room, including customized storage for toiletries, a laundry hamper (pictured below left), electrical items with outlets built into the vanity, or even a dedicated make-up vanity (pictured below right). The trend toward larger or open style showers lends itself to a bathroom built for two. A larger shower can accommodate two people, as well as more than one shower head with customized spray settings and heights for different users. Built-in storage niches ensure that everyone has space to keep their toiletries at arm’s reach. If you enjoy a relaxing soak in the bathtub or have small children, a larger tub may be a requirement. In addition to taking up more space, a larger tub or powerful shower may affect your plumbing considerations in terms of the configuration, size of pipes, and the size of your water heater. These can be addressed in a bathroom renovation project, but keep in mind it will affect your budget. Consider who will be using the shared bathroom and determine your must have items to make sure you meet everyone’s needs. Combine this with a calm, neutral color scheme, perhaps offset by an accent color if you can all agree on one! See more bathroom ideas for shared bathrooms in our design gallery here.